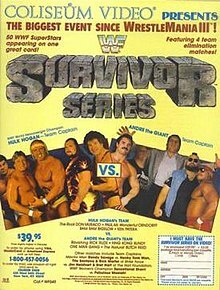 Survivor Series (1987) was the first Survivor Series professional wrestling pay-per-view (PPV) event produced by the World Wrestling Federation (WWF). It took place on Thanksgiving Night, November 26, 1987, and was held at the Richfield Coliseum in Richfield Township, Ohio. The Biggest Event Since WrestleMania III! The main event was a Survivor Series match where André the Giant's team defeated Hulk Hogan's team when André eliminated Hogan's team member Bam Bam Bigelow to become the first lone survivor in the history of the Survivor Series. The entire undercard featured Survivor Series matches which included Randy Savage's team defeating The Honky Tonk Man's team and The Fabulous Moolah's team defeating Sensational Sherri's team. The event also featured a 10 tag team elimination match in which Strike Force and their teammates defeated The Hart Foundation's team. The event was added after WrestleMania III, to market the success from Hulk Hogan and André the Giant's rivalry. Vince McMahon threatened cable companies who aired the NWA's Starrcade (which was going head-to-head with Survivor Series on Thanksgiving night, 1987) instead of Survivor Series would not be allowed to broadcast WrestleMania IV. Most cable providers gave into McMahon's threat and only a handful aired Starrcade. The main feud heading into Survivor Series included André the Giant, One Man Gang, King Kong Bundy, Butch Reed and Rick Rude against Hulk Hogan, Paul Orndorff, Don Muraco, Ken Patera and Bam Bam Bigelow. In January 1987, Hogan was awarded a trophy for his third year as WWF World Heavyweight Champion while Hogan's best friend André was awarded a smaller trophy than Hogan's, for being undefeated in WWF for 15 years. Hogan congratulated his friend and said that André was the real champion of superstars all around the world. André surprisingly left the place before Hogan could even finish. In February, he came with a new manager Bobby Heenan. When Hogan came to know about that, he begged André not to keep Heenan as his manager because Heenan was Hogan's longtime enemy. André said that he had come to challenge Hogan for the WWF World Heavyweight Title at WrestleMania. He ripped off Hogan's Hulkamania shirt and golden chain, turning heel. This culminated in their historic match at WrestleMania III, where Hogan defeated André to retain the title. During the match, he set a record by scoop slamming the 520-pound Frenchman. On August 22, 1987 edition of Prime Time Wrestling, Paul Orndorff fired Bobby Heenan as his manager when he came to know that Heenan had brought in a new wrestler Rick Rude to replace Orndorff. Orndorff appointed Oliver Humperdink as his manager to feud with Rude. Superstar Billy Graham got involved in a feud with Butch Reed, culminating in a match between the duo. One Man Gang interfered in a match where he hit Graham with a big splash on the concrete floor. Don Muraco came to the rescue of Graham and Graham who was scheduled to participate in the main event of the first-ever Survivor Series retired due to an attack by One Man Gang. Muraco replaced him. Ken Patera got involved in a feud with Bobby Heenan and The Heenan Family and turned babyface, and was chosen to be the fourth member on Hogan's team. Many heel managers wanted to manage Bam Bam Bigelow, but Bigelow chose Oliver Humperdink as his manager thus making his WWF debut as a babyface. He also became a part of Hogan's team. Randy Savage had been a heel since his WWF debut in the summer of 1985. He turned babyface in late 1987, after WWF Intercontinental Heavyweight Champion The Honky Tonk Man claimed to be the greatest Intercontinental Heavyweight Champion. This led to a feud between Savage and Honky, leading to Savage's face turn. On October 3, 1987 edition of Saturday Night's Main Event, Savage challenged Honky for the title winning by disqualification. The title remained with Honky because a title cannot change hands by a DQ. Harley Race had won the 1986 King of the Ring tournament and was so proud about this that he called himself King Harley Race and wore a crown and cape to the ring. Jim Duggan did not agree with the fact and this placed Duggan and Race into a feud, with Duggan winning most of the matches. Jake Roberts also feuded with Honky Tonk Man after Honky hit a guitar on Roberts on an edition of Snake Pit, completing Roberts' babyface turn. A match was booked for Survivor Series featuring Savage, Roberts, Ricky Steamboat (whom Honky Tonk had defeated to win the Intercontinental Heavyweight Title), Brutus Beefcake and Duggan against Honky, Hercules, Danny Davis, Ron Bass and Race. The major ongoing tag team feud pitted the face Strike Force and the villainous Hart Foundation. Tito Santana and Rick Martel formed Strike Force in the summer of 1987 after Santana rescued Martel from a beating by The Islanders. Strike Force quickly became a top contender for the WWF Tag Team Championship, held by the Hart Foundation (Bret Hart and Jim Neidhart), and on October 28, 1987, Strike Force won the titles when Neidhart was trapped in Martel's Boston crab. The first match of the first Survivor Series was the first Survivor Series elimination match. Randy Savage, Jake Roberts, Ricky Steamboat, Brutus Beefcake, and Jim Duggan faced WWF Intercontinental Heavyweight Champion The Honky Tonk Man, Hercules, Danny Davis, Ron Bass, and Harley Race. Savage's team was seconded by his wife Miss Elizabeth while Honky's team was seconded by Bobby Heenan and Jimmy Hart. Beefcake and Hercules started off before Duggan and Race were tagged in. Duggan knocked Race out of the ring and followed him out where they brawled and both men were counted out and eliminated, leaving four men on each team. Beefcake hit a high knee on Bass, and went on to eliminate him. Team captain Honky himself joined the match and hit his Shake, Rattle and Roll on Beefcake and eliminated him, evening the match at three all. Roberts hit a DDT on Davis and only two men remained in Honky's team, Honky and Hercules. Savage hit the Savage Elbow on Hercules and pinned him, leaving Honky the only member in his team. After being dominated by Savage, Roberts and Steamboat for a couple of minutes, Honky was atomic dropped over the top rope by Savage and ran from the ring with Jimmy Hart and his IC Belt and was counted out. Honky's self-elimination made Savage, Roberts and Steamboat the survivors of the match. The next match was a women's match featuring the team of The Fabulous Moolah, Rockin' Robin, Velvet McIntyre, and The Jumping Bomb Angels (Itsuki Yamazaki and Noriyo Tateno) against WWF Women's Champion Sensational Sherri, WWF Women's Tag Team Champions The Glamour Girls (Leilani Kai and Judy Martin), Donna Christianello, and Dawn Marie. McIntyre did the first elimination by pinning Christianello with a victory roll. Robin hit a running crossbody on Marie and pinned her with the crossbody, leading to three wrestlers on Sherri's team while none of Moolah's team members had been eliminated. Team captain Sherri came into the match and hit Robin with a vertical suplex to eliminate her. Glamour Girls hit a double clothesline on Moolah and Judy Martin, one half of Glamour Girls pinned Moolah to eliminate her. McIntyre pinned Sherri with a victory roll pin. Leilani Kai joined the match and then pinned McIntyre after an electric chair drop. Yamazaki hit a diving crossbody from the top rope on Kai and pinned her to eliminate her. Tateno hit a flying clothesline on Martin and pinned her to win the match. Jumping Bomb Angels became the survivors for Moolah's team. The third match was a tag team variation of the Survivor Series match with 10 tag teams. If a person from a tag team was eliminated, their partner was also eliminated. The match featured WWF Tag Team Champions Strike Force (Tito Santana and Rick Martel), The Young Stallions (Paul Roma and Jim Powers), The Fabulous Rougeaus (Jacques and Raymond Rougeau), The Killer Bees (Jim Brunzell and B. Brian Blair), and The British Bulldogs (Davey Boy Smith and Dynamite Kid) against The Hart Foundation (Bret Hart and Jim Neidhart), The Islanders (Haku and Tama), Demolition (Ax and Smash), The Bolsheviks (Nikolai Volkoff and Boris Zhukov), and The New Dream Team (Greg Valentine and Dino Bravo). Santana hit a flying forearm smash on Zhukov and pinned him to eliminate Bolsheviks for the first elimination of the match. Jacques hit a diving crossbody on Ax but missed the move and was pinned by Ax, eliminating Fabulous Rougeaus. Ax's partner Smash was disqualified, eliminating Demolition. Neidhart pinned Santana to eliminate Strike Force and Haku pinned Dynamite Kid to eliminate British Bulldogs. Next came Roma and Valentine. Roma hit a diving sunset flip on Valentine to eliminate The New Dream Team. Bret Hart and Jim Brunzell were next. Tama dropkicked Hart and then Brunzell rolled over Hart to eliminate Hart Foundation. The referee gave his attention to the Harts, who had been eliminated. Brian Blair put on his Killer Bees mask and pinned Tama with a sunset flip to eliminate Islanders. As a results, Young Stallions and Killer Bees won the match and became survivors for their team. The main event was a Survivor Series match where André the Giant, One Man Gang, King Kong Bundy, Butch Reed, and Rick Rude faced WWF World Heavyweight Champion Hulk Hogan, Paul Orndorff, Don Muraco, Ken Patera, and Bam Bam Bigelow. Muraco was not scheduled to compete in the match but replaced Billy Graham, who was originally scheduled to be Hogan's teammate but retired because of his hip injury suffered during a match against Reed. Hogan eliminated Reed after he hit a leg drop on Reed and pinned him to eliminate him first. Patera was eliminated after falling victim to One Man Gang's Flying Clothesline. Thereafter, Orndorff (who had recently turned face) and Rude began brawling to advance their feud over who had the better physique; Orndorff gotten the best of Rude until Bundy distracted him, allowing Rude to use a roll up to score the pin. Muraco (who had also recently turned face) joined the match and powerslammed Rude to eliminate him. One Man Gang entered and then hit Muraco with a 747 Splash to eliminate him, giving André's team a three–two advantage. One Mang Gang and Bundy began dominating Bigelow, when André was tagged in to go for the kill. However, Bigelow ducked an André punch and tagged in Hogan. Hogan immediately began getting the better of André and was setting up for a running elbow smash, when he was pulled out of the ring by Bundy; Hogan fought off both heels but was kept out of the ring long enough to be counted out. Hogan re-entered the ring to argue with the referees, but ring announcer Howard Finkel informed the crowd that if Hogan did not leave the ring immediately, Andre's team would win the match automatically. Bigelow—the lone remaining member of Hogan's team—fended for himself, using a Slingshot to eliminate Bundy, then pinning One Man Gang after he missed a 747 Splash. Bigelow eventually fell victim to André, who hit a butterfly suplex to win the match. After the match, Hogan returned to the ring and attacked André, hitting him with his title belt and knocking him from the ring. 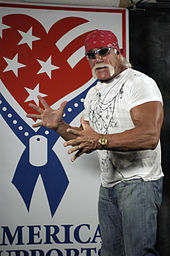 Hulk Hogan and André the Giant engaged in a war of words over the WWF World Heavyweight Championship during the following months, with the feud taking on a new level when Ted DiBiase – who was Hogan's primary challenger at the time – announced he planned to offer Hogan a cash buyout in exchange for the title, which Hogan emphatically refused. With fan anticipation of a Hogan-André rematch, André sneak attacked Hogan on Saturday Night's Main Event, choking the champion until he was virtually unconscious, and shortly thereafter, DiBiase announced his alignment with André to help him win the championship. At the first Royal Rumble supercard on January 24, 1988, Hogan and André signed a contract for a WrestleMania III rematch. Their WWF title rematch took place on the first-ever edition of The Main Event on February 5, 1988 where André controversially defeated Hogan for the WWF World Heavyweight Championship. However, his reign was short lived. In fact, he was the shortest reigning WWF World Heavyweight Champion in history as his reign lasted even less than a minute as he sold the title to DiBiase. WWF President Jack Tunney immediately vacated the title and it was defended in a 14-man tournament at WrestleMania IV, with the winner winning the vacant title. With help from former champion Hogan, Randy Savage defeated DiBiase in the finals of the tournament to win the vacant WWF World Heavyweight Championship. Savage continued to battle the Honky Tonk Man for the Intercontinental Championship, but was unsuccessful. However, Savage would be entered in the championship tournament at WrestleMania IV, defeating DiBiase in the final match to win the title. Honky, meanwhile, went on to a record-setting reign Intercontinental Championship reign, holding the title 454 consecutive days until the inaugural SummerSlam, when he was pinned by The Ultimate Warrior. Demolition went on to replace the Hart Foundation as the top heel tag team in the WWF, becoming over with fans with their charisma and power brawling. As tag team champions Strike Force finished their feud with Hart and Neidhart -- the feud was ultimately blown off in the winter of 1988 with a series of steel cage matches, most of them having Savage join Santana and Martel, and Honky join the Harts -- Demolition continued to dominate the tag team ranks before challenging Strike Force for the tag team belts. At WrestleMania IV, Demolition defeated Strike Force to win the tag team belts, and went on to a then-record 478-day reign as champions. ^ a b c d e f g h i j k l m "Survivor Series 1987 results". Wrestling Supercards and Tournaments. Retrieved 2008-05-27. ^ a b c d e f g h "Survivor Series 1987 review". Complete WWE. Retrieved 2008-05-27. ^ a b c "Survivor Series 1987 results". Online World of Wrestling. Archived from the original on 2008-06-16. Retrieved 2008-05-27. ^ a b c "Andre the Giant, One Man Gang, King Kong Bundy, "The Natural" Butch Reed & "Ravishing" Rick Rude def. Hulk Hogan, Bam Bam Bigelow, "Mr. Wonderful" Paul Orndorff, Don Muraco & Ken Patera". WWE. Retrieved 2008-05-27. ^ a b c d e f "Survivor Series 1987 official results". WWE. Retrieved 2008-05-27. ^ Hoops, Brian (2007-12-18). "SPECIALIST – 20 Years Ago: Detailed look back at Starrcade '87 with Flair vs. Garvin". Pro Wrestling Torch. Retrieved 2008-03-09. ^ a b c d e f McAvennie, Mike (2007-03-30). "The Big One". WWE. Retrieved 2008-05-27. ^ "Andre the Giant vs. Hulk Hogan – WWE Championship". WWE. Retrieved 2008-05-27. ^ a b c d e f g h i "WWF Show Results 1987". Angelfire. Archived from the original on 2008-02-22. Retrieved 2008-05-27. ^ "Saturday Night's Main Event results – October 3, 1987". WWE. Retrieved 2008-05-28. ^ "Royal Rumble 1988 review". Complete WWE. Retrieved 2008-05-29. ^ "The Main Event results – February 5, 1988". Online World of Wrestling. Retrieved 2008-05-29. ^ a b "André the Giant's first WWE Championship reign". WWE. Retrieved 2008-05-29. ^ "WWE World Heavyweight Championship". Complete WWE. Retrieved 2008-05-29. ^ "Randy Savage's first WWE Championship reign". WWE. Retrieved 2008-05-29. ^ "WrestleMania IV official results". WWE. Retrieved 2008-05-29. ^ "Randy "Macho Man" Savage vs. "Million Dollar Man" Ted DiBiase WWE Championship Tournament Finals". WWE. Retrieved 2008-05-29.